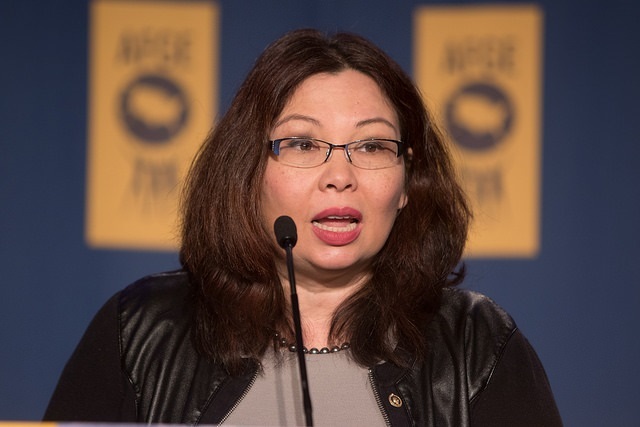 The office of Illinois Senator Tammy Duckworth made a joyous announcement Monday: Duckworth has given birth to a healthy baby girl. “Bryan, Abigail and I couldn’t be happier to welcome little Maile Pearl as the newest addition to our family and we’re deeply honored that our good friend Senator (Daniel) Akaka was able to bless her name for us — his help in naming both of our daughters means he will always be with us,” she said in a statement. Duckworth will reportedly be taking 12 weeks of maternity leave in Washington, D.C., so she can be available to vote if necessary. Duckworth is the first senator to give birth while in office, which is just one of many ways she has shown to overcome challenges and shatter boundaries. A former lieutenant colonel in the Army, Duckworth was a helicopter pilot whose Black Hawk was shot down in Iraq in 2004. She lost both of her legs, making her the first female double amputee, and after retiring from the Army, Duckworth began a political career, serving in the United States House of Representatives before serving in the Senate. While the birth of Duckworth’s daughter is wonderful news, it is worth pointing out that Duckworth is an ardent supporter of abortion. This is problematic, because as Duckworth herself shows, women are very capable of overcoming the challenges that may come with that pregnancy. For Duckworth, her challenges were numerous: her political career, her disability, her age. All of these are factors that can make pregnancy more difficult. But Duckworth was able to rise above them. There is an assumption in the world today that when women face an unplanned or inconvenient pregnancy, the clear solution is to have an abortion. It is presumed that a woman could not possibly work, especially not in a demanding job, or go to school while pregnant or raising a child. It is an exceedingly misogynist worldview, one that abortion only helps to further perpetuate. As Nancy Flanders pointed out in a previous article for Live Action News, Duckworth has done much good and laudable work for mothers: helping military moms, co-sponsored bills for paid paternal leave and affordable childcare, on-campus childcare for students. But she also supports abortion, which in many ways devalues the good work she has done to help support mothers. Because as long as abortion continues to be legal, women experiencing unplanned pregnancies will be pressured to have abortion, without anyone there to help them and reassure them that they can handle the challenge, too. Imagine how much good Duckworth could do if she abandoned her support for abortion and worked to support women in crisis pregnancies more. Duckworth is an intelligent, strong, capable woman who is incredibly blessed to have given birth to her second child. Why not empower other women to follow in her footsteps instead?